Photo(s) by Dan OswaltWine slushies? It's a no-brainer! Order a frosé at Brys Estate. Nothing quite captures the character of summertime like sipping from a glass of rosé. These local Northern Michigan favorites will have white and red drinkers alike vying for a blush-colored bottle. Bursting with notes of raspberry and strawberry and finishing with just a hint of orange zest and watermelon, it’s the perfect pick-me-up for fruit-fanatics. Capturing the essence of the Leelanau Peninsula terroir, this fragrant rosé is best enjoyed taking in its namesake on the Michigan lakeshore. Dark berries and cherries persist in this lush rosé that sips just as well solo as it does paired with something fresh from the grill. Look for hints of watermelon and strawberry in this classic dry rosé that won Best in Class in the San Francisco International Wine Competition three out of the last five years. A playful twist on the pink classic, this effervescent bubbly sparkles with notes of bright cherry and strawberry, making it a vivacious refresher. 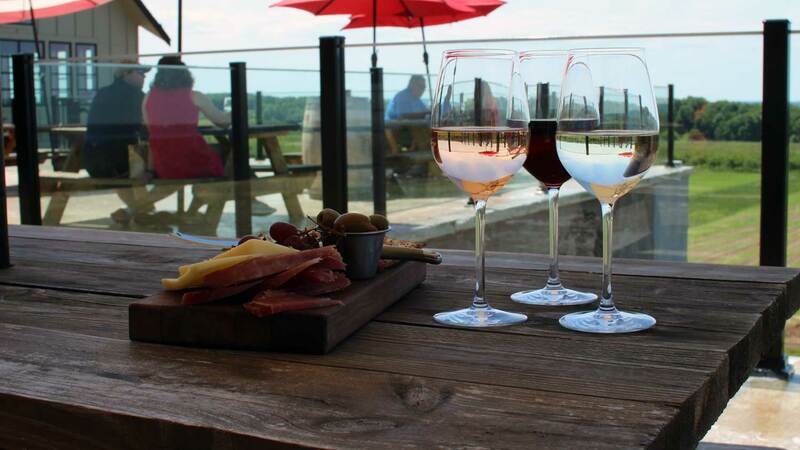 Enjoy the star of Bonobo Winery while taking in the lush vineyard from their patio. This alluring, light-bodied blend of Pinot Gris, Gewürztraminer and Pinot Noir charms with the sweetness of pear and apricot, securing its position as Bonobo’s best-seller. Stemming from the vines of the Wind Whistle Vineyard, this fairly dry sipper sparkles with a touch of strawberry, watermelon and pomegranate. A provocative blend of Pinot Noir, Gamay Noir, Merlot and Cabernet Franc, this award-winning combination leads with robust berry flavors and finishes with subtle oakiness. A delightful fusion of raspberry, strawberry, blackcurrant and vanilla cream, this rosy-hued vino enchants the senses with the subtle fragrance of violets. No summer rosé list is complete without a wine slushie! This frozen concoction of pinot noir and riesling is delicately blended with strawberry and garnished with a lemon wedge, epitomizing the essence of Northern Michigan’s summertime wine country. Check out the July issue of Traverse, Northern Michigan’s Magazine for five more rosés we love and a Q&A with Creighton Gallagher, owner of Rove Estate Vineyard & Winery.